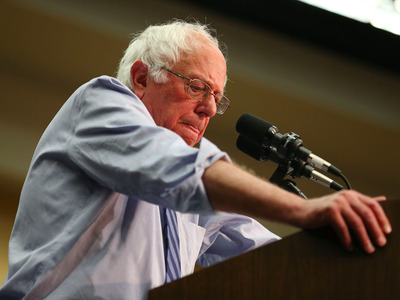 Democratic presidential hopeful Bernie Sanders is preparing to lay off about half of his campaign staff on Wednesday after a disappointing showing in primary states on Tuesday, The New York Times reported, citing two unnamed sources close to the campaign. The news came after the Associated Press declared Hillary Clinton the presumptive Democratic nominee for president. Clinton also won the New Jersey primary on Tuesday. Despite these setbacks and the planned layoffs, the Vermont senator reportedly plans to continue his bid for the Democratic nomination. His campaign has noted that superdelegates can still switch support from Clinton to him before her status as the nominee is cemented at the Democratic National Convention in July. Sanders will next campaign in Washington, DC, which holds the final primary of the 2016 cycle on June 14, according to the Times. Sanders won the North Dakota primary on Tuesday, but it netted him only 10 delegates. California also voted Tuesday, but the Democratic Party’s system of allocating delegates proportionally, rather than allowing some winner-take-all states, makes it more difficult for Sanders to catch up to Clinton.